Oct. 1 was the first day Airmen were authorized to wear the Operational Camouflage Pattern Uniform across the Air Force, but how do Airmen know what local policies may be in effect during this transitional time? An OCP patrol cap with spice brown thread embroidered Velcro or sewn nametape on the back. For commissioned officers the cap includes a sewn on rank ½ inch centered above the visor. The OCP blouse shall be worn with nametape and U.S. Air Force tape, embroidered with spice brown thread. Air Force Aeronautical, Space, and Cyberspace “wings” are mandatory. Occupational badges, other than wings, are optional on the OCP blouse. Rank Insignia is mandatory for all personnel and will be spice brown, with the exception of First Lieutenant and Lieutenant Colonel ranks, which will be black. The right sleeve of the OCP blouse will feature an American flag patch, with spice brown threading, with the flag facing “backwards,” giving the appearance of the flag blowing in the wind. Until further guidance is issued, approved unit and higher headquarters patches, usually positioned on the right and left sleeve, respectively, are optional. OCP trousers will be worn with coyote brown riggers belt and pant legs tucked or bloused into boots. Socks may be Desert Sand, Tan or DLA-issued Green socks until 1 June 2020, when Airmen will only wear DLA-issued Green socks. Airmen may wear either Tan or Coyote Brown boots with the OCP. On 1 June 2020, Coyote Brown boots will be worn with the OCP and the flight duty uniform. 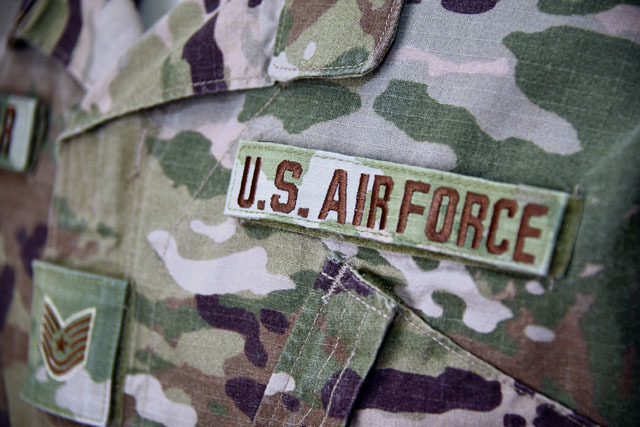 According to Air Force officials, Airmen are not permitted to wear the OCP uniform unless the uniform includes all mandatory wear items identified above. Airmen can purchase the OCP initially at an AAFES Military Clothing Sales Store at the following locations starting Oct. 1, 2018: Aviano Air Base, Charleston Air Force Base, Shaw Air Force Base, and MacDill Air Force Base. From there, officials expect manufacturing levels to ramp up across all AAFES locations world-wide in the months thereafter. As production increases, AAFES will post locations on their web page where and when you can purchase OCPs at your servicing locations. Officials also expect AAFES online purchasing to commence around October 2019. Officials continued to stress that inventories readily available at AAFES are based on current Army demand levels. To prevent any shortages, adjustments to inventory levels will be completed once the transition begins. When purchasing uniforms at AAFES stores, service members must show proof of service branch and rank, and/or deployment orders to acquire the appropriate uniform and accessories. Airmen can dispose of the Airman Battle Uniform by destroying it. 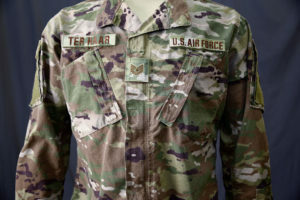 To properly destroy the uniform, Airmen should first remove all rank/grade insignia, name tapes and other identifiers sewn onto them, and then render the uniform unable to be physically worn by cutting the material. Members living on and off base are authorized to dispose of the cut uniform material at their local Ramstein and Vogelweh recycling centers.